The world of Haute Horlogerie knows several mechanisms that are designed to improve a timepiece’s precision. There’s the tourbillon (who doesn’t know it), the dead beat second hand (maybe you haven’t realized it, but this was also developed with precision timekeeping in mind), and last but not least a constant force mechanism. Arnold & Son has created the pinnacle of precision timekeeping with a timepiece that comprises all three aforementioned mechanisms. 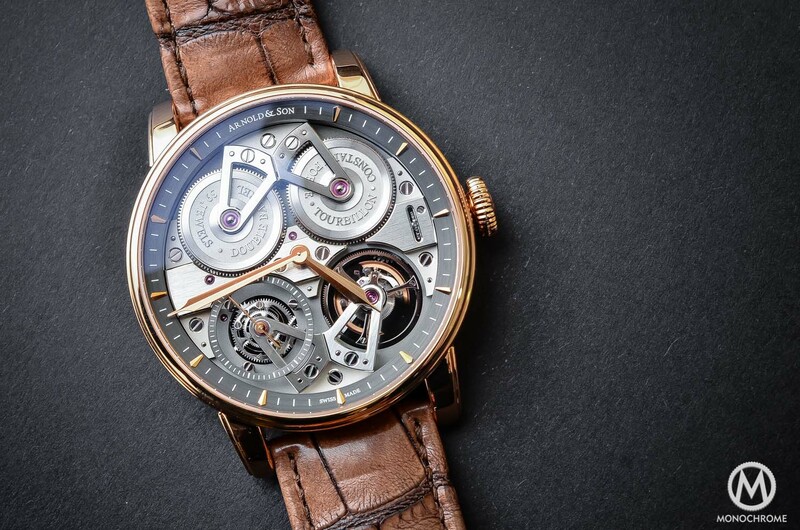 Let’s have a closer look at the Arnold & Son Constant Force Tourbillon. 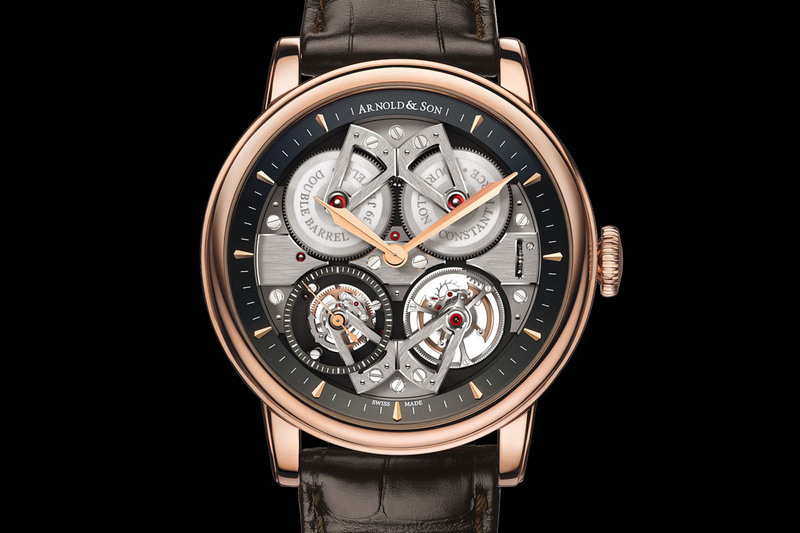 Like all watches from Arnold & Son the Constant Force Tourbillon, which is part of the Royal collection, features an in-house developed, designed, manufactured, finished and assembled movement. 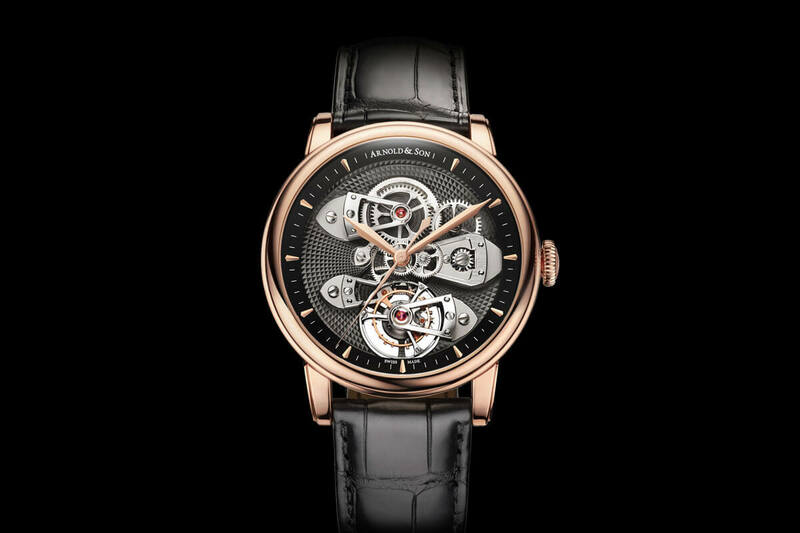 Its symmetrical architecture features two main spring barrels at the top, and the constant force device, which provides a unvarying flow of power to the tourbillon, and the tourbillon itself are at the bottom of the dial. The finishing of all movement parts is superb, and features not only classic finishing like hand-chamfered bridges with polished edges and brushed surfaces, screwed gold chatons, screws with bevelled and mirror-polished heads. The nickel-silver (also called German silver) main plate is NAC grey treated, and the bridges have been treated with palladium. Take for starters the tourbillon, which was once developed to improve precision timekeeping of ship’s chronometers and later pocket watches. In those timepieces, the tourbillon made sense, as it only works when the timepiece is kept in one position. The tourbillon, which makes the entire escapement rotate, equals the potential flaws due to gravity’s pull on the extremely fine and fragile escapement parts. In a wrist watch the tourbillon looks great, however it is not effective, and not even designed for a wrist watch. 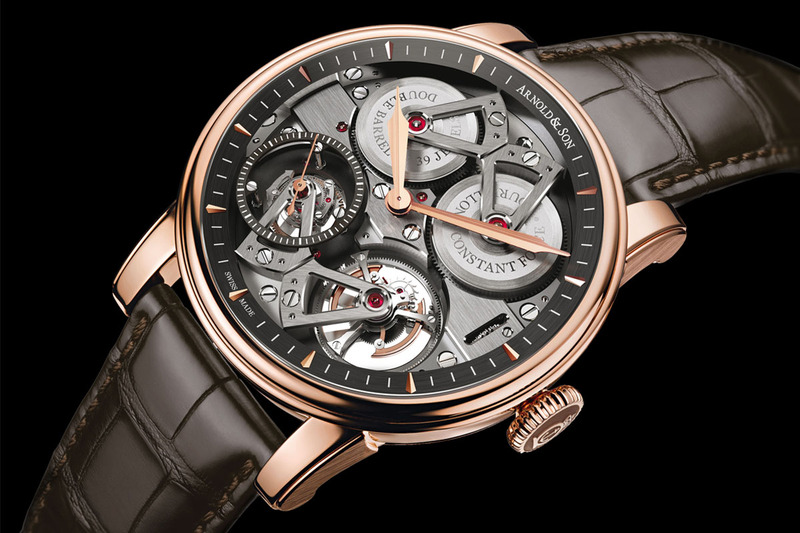 Secondly the dead (beat) seconds, or seconde morte in French, or as Arnold & Son refer to it: true beat seconds. The second hand of a mechanical watch, in fact of every mechanical watch, makes tiny jumps, usually between 5 and 10 per second (depending on the beat rate). That’s why it looks as if the second hand rotates smoothly around the dial in one minute. This complication that has its roots in old pendulum clocks, and later found its way to pocket watches among others. The purpose was that the jumping second hand makes it easier, and more precise, to exactly pinpoint a moment. “Now it’s so and so late” is much easier when the second hand jumps, instead of the usual second hand that moves smoothly. Last, but certainly not least, we have arrived at what is possibly the only mechanism that can improve the chronometric rates of a mechanical watch. A constant force mechanism does nothing more and nothing less than keeping the supply of energy to the escapement steady. Picture this: a watch is fully wound, and the main spring is ‘charged’ with enough power to keep the watch running for a specific time. The main spring, like every other spring, has more torque when it’s fully wound, and less when it’s almost unwound. That also means that a fully wound main spring delivers more torque, that goes through the gear train, to the escapement, and an almost unwound main spring provides the escapement with less energy. This fluctuation of energy makes it more difficult to regulate a watch, and has a negative influence on the chronometric performance of that watch. A constant force mechanism delivers a steady supply of energy that does not fluctuate when the torque in the main spring fluctuates. 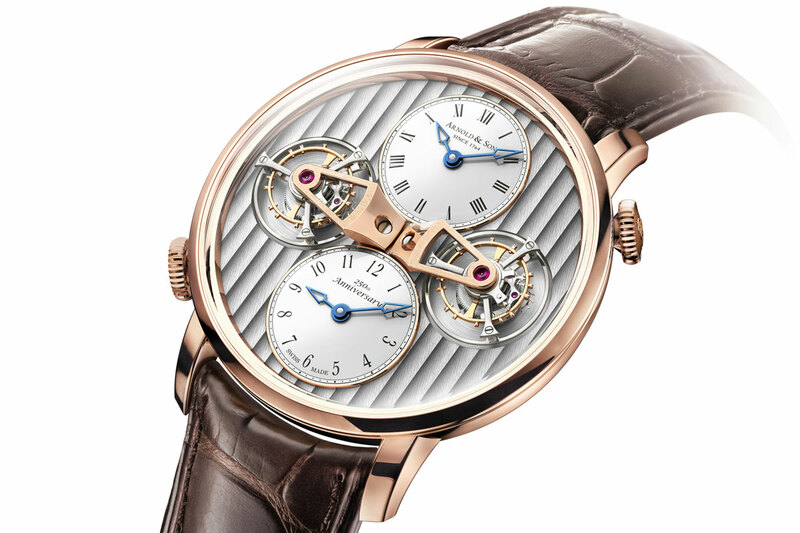 The constant force mechanism that Arnold & Son choose to use, is a so called remontoire. This is a small spring, which is being charge and releases its energy to the escapement. That small spring will always release the same amount of energy, no matter if the main spring is fully loaded and has a lot of torque, or whether the main spring is almost unwound. When the power from the mainspring drops below that required to charge the small spring of the constant force mechanism, the movement stops rather than running at lower precision. The constant force mechanism also drives the true-beat second hand, and it rotates once per minute in increments of one second. 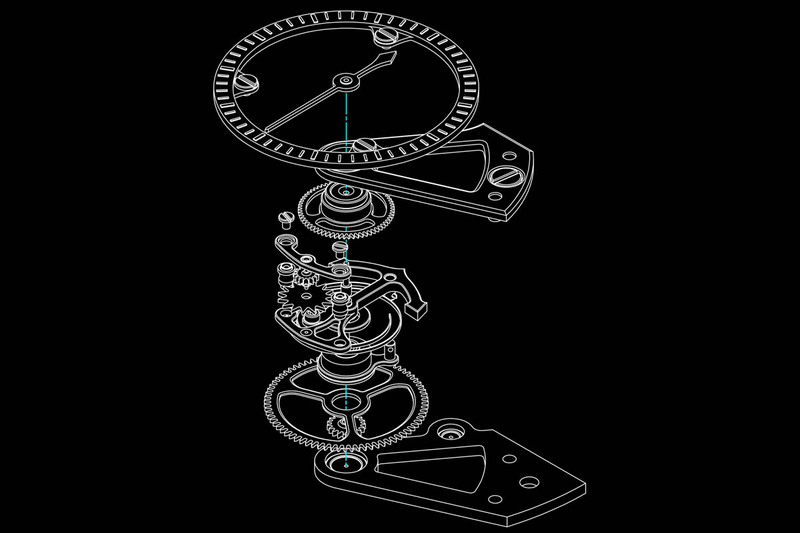 So we can actually say that the only mechanism that truly improves a watch’ precision, is the constant force mechanism. That and a very good watch maker who regulates a watch. Is that it? Well, no. Another way to make improve the stability of the energy flowing through the gear train, to the escapement, is to opt for a main spring with less torque. This is of course no constant force mechanism! It can be achieved, like Arnold & Son do in this Constant Force Tourbillon, by using two main spring barrels that together deliver 90 hours of energy. One way or another, the Arnold & Son Constant Force Tourbillon is the pinnacle of precision timekeeping, and offers a spectacular view on all technicalities. This is the kind of watch that we here at Monochrome just love. 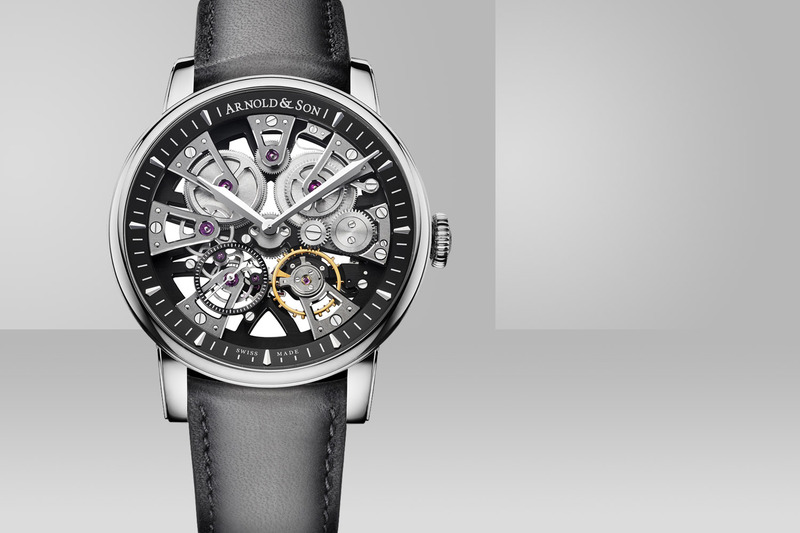 The Arnold & Son Constant Force Tourbillon retails for CHF 174.900 Swiss Francs (before VAT). 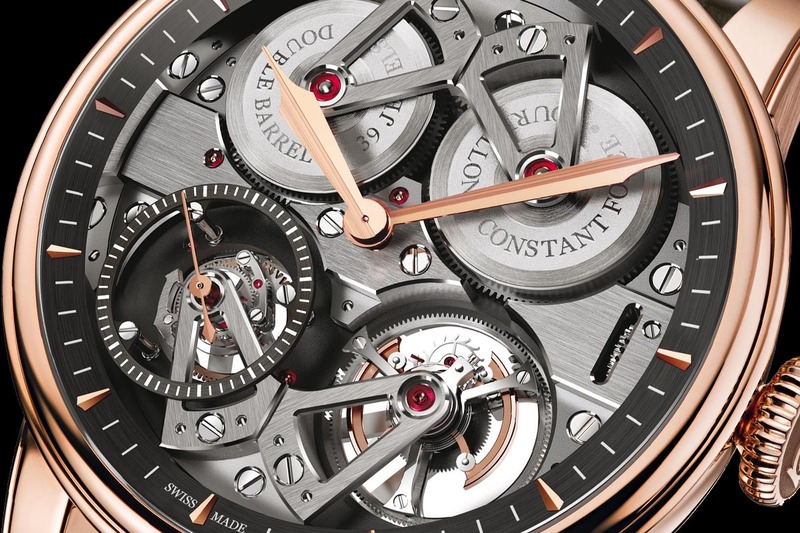 This technical pinnacle of watchmaking and chronometry is limited to 28 pieces.